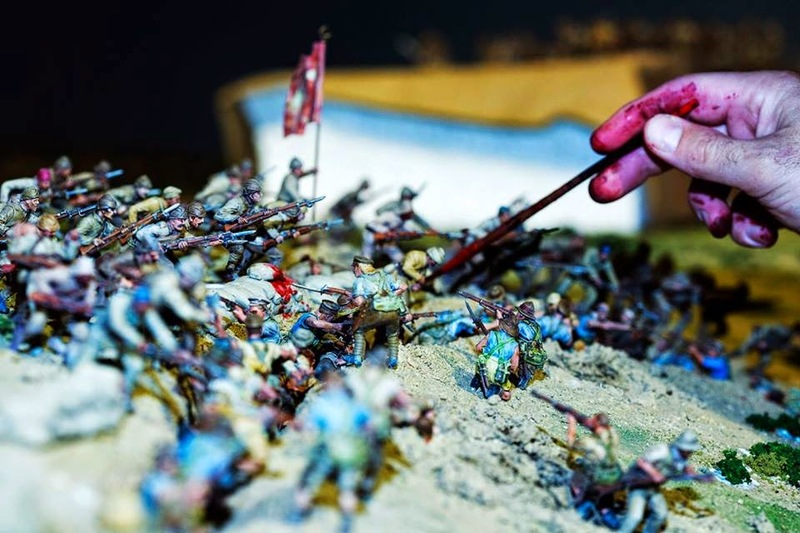 There are only a few days now until the diorama of Chunuk Bair opens at The Great War Exhibition in Wellington. The ANZ New Zealand room is set to open on Monday 4th May 2015! It is a special space in the Exhibition as it focuses on New Zealand’s story. The ANZ New Zealand room contains a large scale diorama of the battlefield at Chunuk Bair featuring an army of over 5000 miniatures. It depicts that battle in the Gallipoli campaign where, on 8 August 1915, the Wellington Battalion under Lieutenant Colonel Malone took and defended the Turkish defences on the heights of the ridge line overlooking the Gallipoli beach head. The diorama shows the desperate fighting, bravery and leadership on both sides that characterised this crucial battle. The diorama has actually been ready since before Anzac Day, but other items in the New Zealand Room of the exhibition are still having some finishing touches done. I know people are keenly waiting to see photos of the diorama. However, pictures are embargoed until after the opening, so I'll be posting them here after that. Having seen the diorama in its last stages of development, I can say the wait will be worth it. It is absolutely stunning. And I mean not just 'stunning' in the way it looks with so many lovingly painted 54mm figures on such a large terrain, but actually 'stunning' by its heart-rending impact on the spectator with the huge amount of carnage it shows. This is no normal sanitised wargames table - it is a 'no holds barred' freeze-frame of the bloody squalor that the real battlefield would have been on that day. Painting the figures, especially the casualties, has been a very emotional task. Perhaps this is part of the reason that the project has built up an incredible atmosphere amongst the 140 volunteer painters involved. The painting project has brought together wargamers from different clubs all over the country, as well as lots of non-club wargamers and painters. It has brought together gamers of every genre, most of whom had never painted WW1 or 54mm before. It has resulted in a camaraderie between the volunteer painters and the professional model-makers from Weta Workshop who did the terrain. And through the loads of media interest the painting project has created, it has brought the hobby out into the public arena in a definitely "non-geeky" way. Overall, it has made us all feel proud that we have really done something special to commemorate this important event in New Zealand's history. So please drop by this blog after the diorama opens, and see for yourself the results of this amazing project.